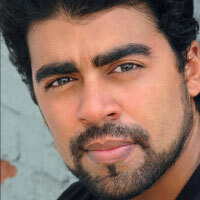 GABRIEL RUIZ is a proud ensemble member of Teatro Vista. Select Chicago credits include Agamemnon, Man in the Ring (Court); Cry It Out, Mansfield Park (Northlight Theatre); You Got Older, The Rembrandt, The Way West (Steppenwolf); Native Gardens (Victory Gardens); Arcadia, Company (Writers); City of Angels, Singin’ in the Rain (Marriott); The Upstairs Concierge (Goodman); The Wolf at the End of the Block, White Tie Ball (Teatro Vista); Creditors (Remy Bumppo); Working: The Musical (Broadway Playhouse); Richard III (Chicago Shakespeare); and Arabian Nights (Lookingglass). His regional credits include Native Gardens (Cincinatti Playhouse), Harvey (Milwaukee Repertory Theatre), and Blood and Gifts (Lincoln Center for the Performing Arts, New York). He has composed music and lyrics for Don Chipotle performed at DCASE, Epic Tale of Scale (Chicago Children’s Theatre), and Vietgone (Writers). He has appeared on television in Boss, APB, Electric Dreams, Chicago Fire, Chicago Justice, and Chicago PD.